It’s like You’ve Got Mail with psychics! In Your Eyes is a movie with a title that references a Peter Gabriel song, but does not feature said song in the movie. What gives? It does, however, feature many other indie songs all throughout the movie. In fact, it uses the sentimental music montage as a bit of a crutch. When your two lead characters are separated by almost the entire country, I guess it’s hard to create scenes of a growing love without some good ol’ montages. The story, written by Joss Whedon, features two lonely folks, Rebecca (Zoe Kazan) and Dylan (Michael Stahl-David). Rebecca is stuck in a loveless marriage with a controlling doctor, while Dylan is an ex-con, on parole, working at a car wash. One day, the two suddenly gain the ability to experience the world through each other’s eyes. Why? How? Doesn’t really matter. Make up your own reason. I believe unicorns were involved. They were both licked by unicorns. After quickly (too quickly) adjusting to and accepting this new discovery, the two begin getting to know each other and helping each other with their problems and issues. I certainly don’t fault this movie for having such an unexplained, fantastical premise. But I do fault it for playing it pretty safe with how everything unfolds. It goes pretty much exactly as you’d expect it to…at least until it becomes a borderline thriller at the end. That felt a little out of place. A movie with this plot could go a few different ways. On one end of the plot spectrum, it could have been a slapstick comedy with one goofy, awkward situation after another. Not something I’d want to see. On the opposite end of the spectrum, it could have been darker, riskier, edgier. Maybe one of the characters could have been disabled, or they could have been different ethnicities, or heck, even if one of them wasn’t particularly attractive, that could have been something. But no, like I said, this one plays it close to the middle on that spectrum, going for the safe romantic-comedy angle. like it? no…i LOVE your creepy mustache. If you’re like me, and there was ever a time that you had strong feelings for somebody you only knew through your computer, then you’ll probably relate to this movie. Especially if it was back in the earlier days of the internet when all you had were a couple pictures, text via instant messenger, and, if you’re lucky, a voice on the telephone. It was the voice on the phone that made it all the more real. And in Her, a voice is all Theodore (Joaquin Phoenix) needs to fall in love. Can you really know somebody with just a voice? Is being in someone’s physical presence necessary for a relationship? Do you ever really know them, or are you just filling in the missing gaps with everything it takes to make them perfect? I really enjoyed this movie. It’s not perfect, but it seems very real…very possible. We already live in a world where people walk in groups but don’t speak to each other. All focused on their phones instead. There’s a scene in Her where Theodore is walking through a crowd of people, all the while talking to his new operating system (voiced by Scarlett Johansson) via a small earpiece. You’d think he’d stand out as a crazy person, seemingly talking to nobody, but he doesn’t because just about every other person is doing the same thing. A cacophony of conversations, none of which are directed at each other. This movie is set in the near future, but that future might turn into the present sooner than we think. I thought Spike Jonze came up a bit short in the emotional department when he made Where the Wild Things Are. Not the case here. Maybe it’s due to my aforementioned experience in the internet romance world from many years ago, but I felt much more of a connection to the characters and their emotions in Her. Phoenix does a great job, as does Amy Adams as Theodore’s mousy friend who is having her own relationship problems. I wasn’t crazy about Johansson’s voice as Samantha, the operating system, but I got used to it. The music is good, the cinematography is lovely, and Jonze does a nice job of creating a world that seems overly clean/sterile/pristine perhaps due to the lack of human interaction. At first the plot about the operating systems getting so smart that they feel the need to move on to more important things than serving humans seemed unnecessary, but eventually I saw that as brilliant too. I mean, if we’ve become so bored with actually talking to each other, there’s no reason to think the super-intelligent computers won’t get bored with us too. is somebody over there trying to be quirkier than me!!?? Ah, the Manic Pixie Dream Girl. Whether it’s Zooey Deschanel, Natalie Portman, Zooey Deschanel, Kate Winslet, or…Zooey Deschanel, it’s a character that has become all too familiar in movies – particularly indie movies – in the past decade or so. A quirky, unpredictable girl who brings the male protagonist to life and turns his life into a constant adventure. In this case, it’s Zoe Kazan as Ruby Sparks, who is, quite literally, the dream girl of writer Calvin (Paul Dano). He dreams about her, then begins writing a book about her. Then, to his understandable surprise, one day Ruby materializes in Calvin’s kitchen, seemingly unaware that she had no existence before he dreamed her up. At first all is wonderful and happy for the two (once Calvin comes to grips with this odd occurrence), but eventually Ruby gets bored existing for the sole purpose of making Calvin’s life better. She’s unhappy. So, Calvin writes more in his book, this time making her happy all the time. Her constant joy grows tiresome, so he must write her differently. Needless to say, these rewrites go on for a while as Calvin tries to achieve the perfect balance in Ruby. This movie, written by star Zoe Kazan herself, takes the idea of the Manic Pixie Dream Girl and reveals why this male fantasy puts so much pressure on the girl in question. At one point Ruby says something to Calvin about him not having any friends. He says, “I have you. I don’t need anyone else.” To which she responds, “that’s a lot of pressure.” This MPDG concept puts all the onus on the girl to make a relationship exciting, with the guy just going along for the ride. All he has to do is accept her for who she is. “I love your mess,” Calvin says at one point. This whole idea was explored to a similar extent in Eternal Sunshine of the Spotless Mind. That’s another character, Joel, who simply wants to go along for the ride with Clementine, and she lets him tag along because he’s nice and accepts her manic ways. Though, only for a while, until she gets bored with his lack of emotional intimacy. This is one of those movies that just passes through your brain without really having any effect at all. It’s not particularly funny (doesn’t even really try to be actually), and the emotional moments are all really low-key. No characters or scenes have enough energy to be annoying, so you just drift through it with ease. I will say, though, that the ending is actually somewhat depressing. Tina Fey’s character is left a bit adrift and sad at the end in some regards, and it gives the movie an overall downer feel. It seems like this movie should have been an indie drama but somebody decided to morph it into a romantic comedy. It doesn’t work as either. Basically, if you like Wes Anderson movies, I’d say it’s worth a watch. But I wasn’t totally blown away by it. There are some truly great moments, but there were also times when I felt like it was dragging a little bit, even though it’s only an hour and a half long. The performances by the adults were my favorite aspect of the movie. Edward Norton in particular is great as the geeky Khaki Scout leader, Bruce Willis does a nice job as a sad police officer, Tilda Swinton and Jason Schwartzman have funny guest roles, while Bill Murray and Frances McDormand work well as an unhappy lawyer couple stressing over their young daughter’s behavior. 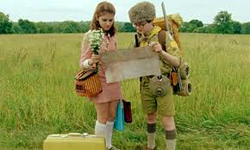 That daughter is played by newcomer Kara Hayward, and the boy she runs away from home with is another newcomer played by Jared Gilman. I have to admit, I wasn’t too impressed with either of them as far as their ability to deliver Wes Anderson’s deadpan dialogue. They seemed a little uncomfortable with it, and I found that distracting. I still find myself wishing Anderson would stick to movies that feel a little more grounded in reality, like the two that remain my favorites – Bottle Rocket and Rushmore. His more over-the-top moments don’t always work for me, and this movie does have a few over the top moments. Keep in mind, though, the first time I saw The Life Aquatic with Steve Zissou, I was pretty lukewarm to negative about it, but on a subsequent viewing, I liked it a lot more. Maybe when I see this one again, my fondness for it will grow. For now, I can recommend it mainly for Norton, Willis, Swinton, Schwartzman, and some moments of truly inspired humor. Maybe after some more viewings I’ll be able to recommend it more for the overall story as well. I’m sorry officer, was I being too quirky? Some good ideas, but some frequent poor execution. This probably won’t make much sense, but while watching this one, I think it seemed like I was enjoying it more than I actually did because I kept thinking about how it could be better. It was only afterward that I realized how many missed opportunities there were and that I had sort of filled in the blanks with my own thoughts on how things should have happened. Overall, what this movie was missing was more emotional depth. If you’re going to make an R rated movie about the end of the world, don’t make it PG-13 with a few extra F-bombs. Go all out! Really show the sadness, anger, debauchery, violence, and even emotional clarity that could result from the situation humanity finds itself in. Much of that is implied, but it’s all seen in glimpses. It’s all very sanitized. It’s a dark comedy that’s just not all that dark. It is certainly funny at times, though. Not outrageously funny, but I laughed on several occasions. I also wanted to check the time on my phone on several occasions as well. There are some dull moments that could have used more emotional punch. It’s director Lorene Scafaria’s first film, and she definitely seemed to play it safe. In fact, the whole movie does. The character development, the soundtrack, the camera shots, you name it, it all seemed…routine. Steve Carrell, as Dodge, is playing essentially an even more toned down version of the character he played in Dan In Real Life, which probably helped bring down the film’s energy even further. 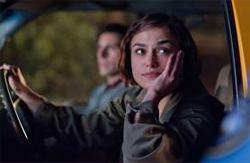 While Keira Knightley, as Penny, is playing a pretty typical quirky character (she likes vinyl records and can sleep through almost anything! ), at least she brought some energy to the role. 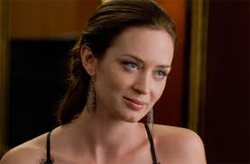 As I mentioned, it is funny at times, and there are some inspired moments, like a scene in a Friendsy’s restaurant with an overly affectionate staff, and then a brief stop at one of Penny’s ex-boyfriend’s place, but those are few and far between. I wanted more from a movie about humanity’s end. I think it’s an occasion that deserves a little more. Oliver: This is the moment where you leave him and come with me. Fifteen year old Oliver (Roberts) must simultaneously deal with falling in love and watching his parents’ marriage possibly begin to fall apart. This is an interesting one that’s had me thinking about it for the last couple days since I saw it. There’s a lot of thought provoking stuff here, but it almost gets buried under a lot of Wes Anderson-y…Amelie-like style. The frequent trips outside of reality are sometimes amusing or helpful to the storytelling, but other times they just serve as distraction. The two spend a lot of time together. Director Richard Ayoade does a good job of injecting these scenes with a certain innocent sweetness, energy and fun. It makes you want to jump into the screen and experience times like that on a Groundhog Day type loop. But you can’t…and neither can Oliver and Jordana. Life gets in the way. 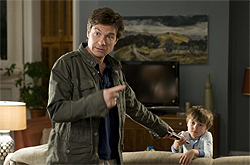 In this case, it’s Oliver’s parents’ problems coupled with Jordana’s own family crisis. Oliver feels like he must save his own parents’ marriage, possibly just so he can feel like maybe there’s hope for his own love to last. Roberts and Paige are both subtly good, capturing the strangeness (and yes, awkwardness) of this odd relationship they’ve got going. It’s the type of movie relationship that could be unbelievable if handled wrong, but I thought they got it just right. I won’t go further into the other complications that arise, but there are many. Can they be overcome? Who knows, but there’s a terrific final scene that shows that Oliver and Jordana are willing to try. Dogs shouldn’t play by railroad tracks. it's so fun not being with you all the time! Zoe: I just don’t understand how two people can go from being in a unit to just being…alone. That’s why I’ll never work in these things…because I know that they’re just gonna end in disaster. This seems like something either George or Jerry would have come up with on Seinfeld. Break up…to save the relationship. Apparently, real life writers/director Zoe Lister Jones and Daryl Wein did actually think up this idea and tried to use it with their own relationship. I guess it worked because they stuck together and made this movie. In the film, however, there are many complications. I mean, obviously…there have to be, or else we wouldn’t really have a movie. There are other people they become interested in, jealousy, anger, misunderstandings, etc. And it’s all hurled at us in a somewhat confusing manner. I kept wanting to like this movie more than I did (despite a touch of the usual indie film pretentiousness), but I was never quite able to track along with the characters’ emotions. From one scene to the next they’d bounce back and forth between anger and happiness, sometimes without any apparent cause. One moment they’re pleased to see each other and getting along, then in the next scene they seem to hate each other. Other characters come and go with little resolution, as do some scenes. At times it seems like they were just trying to throw too much stuff into the mix, and that all distracts from the main storyline. That being said, I did enjoy it to an extent. Jones and Wein are likable enough, there are some funny and sweet moments, as well as two very enjoyable performances from Julie White (probably best known for being in Transformers at the moment) and Andrea Martin as Daryl and Zoe’s respective mothers. I was always looking forward to them being back on screen. It’s an interesting concept, this idea that boredom with life can result in perceived boredom with a mate – even someone you’re totally in love with. And what’s there to do about it? Is time away really the answer? A new person to eventually get bored with perhaps? Like the Submarines say in their song Peace and Hate: Breaking down can not be cured by breaking up. you want to adjust my WHAT? David: What are you doing in here? Elise: Just…I’m hiding from security. Elise: I crashed a wedding upstairs. David: People still do that?? Elise: It was a dare. David: Who dared you to crash a wedding? So, apparently God’s just kinda wingin’ it. That’s the main thing I took from this fairly entertaining, but confusing (or maybe I should say confused), movie. I doubt that’s what the movie makers were trying to get across, but then I’m not sure if they even know what they were trying to get across. It starts off pretty well, with a nice relationship blooming between David and Elise. Damon and Blunt don’t have amazing chemistry, but they play their roles in a nice, low-key way that makes their speedy romance believable. Though, I can’t help but think that the movie makes a tactical error by presenting us with way too much information about the Adjustment Bureau too early in the movie. A little more mystery might have ramped up the tension a bit. As is, it just becomes a sort of cat and mouse game, though in this case the cat doesn’t want to kill the mouse. It just wants to bat it back onto a planned course. David tries to exert his free will, he’s told he doesn’t really have free will, but then he tries anyway, and ya know…he often sort of succeeds. For semi-omnipotent beings, these Adjusters sure do seem to have trouble keeping one guy in line. I called this movie confusing, or confused, because in the end, I just don’t know if the makers knew what they wanted to say or how to say it. There is a hint at the Christian notion of our wills eventually aligning with God’s (or The Chairman, as he/she/it is referred to), thus we would become the author of our own fates, in a way, but that seems to contradict some of the other stuff that’s said in the movie. It just doesn’t gel in the end, and I was left scratching my head. It’s an interesting premise, with some good characters and performances, but the inconsistent story falls a bit flat in the final quarter of the movie. Not enough to totally ruin it, but enough to make me wish that there had been a few more adjustments made to the script. Be nice to people in hats, they might just be some sort of guardian angel. Sebastian: Let’s put lice in the batter! Wally: What is so funny to you about the concept of eating your own lice?? Sebastian: I don’t know, it’s just funny! Here’s my theory on this movie (based only in my own imagination and no facts that I’ve seen anywhere): at some point, there was an interesting, funny-ish script, all set to be made into a quality movie, but then somebody decided to drop it into the big Hollywoodization Machine, and this is what popped out. In addition to suggesting a very predictable ending, the machine suggested that instead of hiring an actress to play an interesting lead character, Jennifer Aniston should be hired and told to just play herself. And that’s the big problem with the movie. There’s this interesting story, with some interesting characters and thought provoking situations, and right in the middle of it is this glamorous movie star. She just doesn’t fit. That’s not to say Aniston absolutely shouldn’t have been in the movie. What I mean is that she should have been playing a character, not unlike the way she played a character in The Good Girl. She is actually capable of that. Instead, we have her walking around looking like a movie star, and it makes no sense to see her in the situation she’s in with the characters she’s surrounded by. Also, the way she’s played (or not played) results in there being absolutely no chemistry between her and Bateman. He’s a quirky, hypochondriac of a character, and their friendship just isn’t believable at all. Caroline Dhavernas shows up for about 2 minutes playing a blind date gone sour, and just those two minutes show how much more interesting she would have been in the lead role. Though, the age difference between her and Bateman probably wouldn’t have worked well either. Thankfully, there are two characters that do have chemistry, and that’s Wally and the 6 year old Sebastian. When these two are together, the movie takes on a whole different feel, and I was always sorry when Aniston came back into the mix. They have interesting and funny stuff to talk about, they grow as characters via their interactions, and you can just tell they’re having a good time with each other. There’s a good movie here, and it’s a shame that it had to get all Hollywooded up. A more believable relationship between Wally and Kassie, as well as more nuanced supporting characters (Juliette Lewis and Patrick Wilson are underwritten, Goldblum is actually pretty funny), could have propelled this thing up to a higher level. As is, it’s watchable, but still a disappointment. Once again we have a character trying to overcome his fears stuck in a movie that’s too afraid to take chances. Sometimes people do stupid things when they’re drunk.